I recently had the privilege of designing my own pair of jeans through Getwear. Basically, you go in and tailor your jeans to fit your body shape. My jeans are skinny, high rise, and short inseam. You can get as specific as you want with your design, right down to the placement of distressing and types/colors of buttons. It's a fun process! Not to mention, when you are done you'll have a pair of jeans that fit your bottom half like a glove. :) If you are interested in my design, you can find them here. how cute are you, my friend? Designing jeans sounds infinitely cool. Love that bracelet, also. Really cute! Love those shoes. You look absolutely fabulous in that top and how fun is that to design your own pair of jeans?! I absolutely love this outfit! I'm more of a jeans than dresses girl so I especially appreciate any outfit posts with jeans. This is the cutest outfit that I have ever seen. I love those shoes. I should try making those jeans. That bracelet is just gorgeous. I am in love with this outfit! The shoes are so cute! 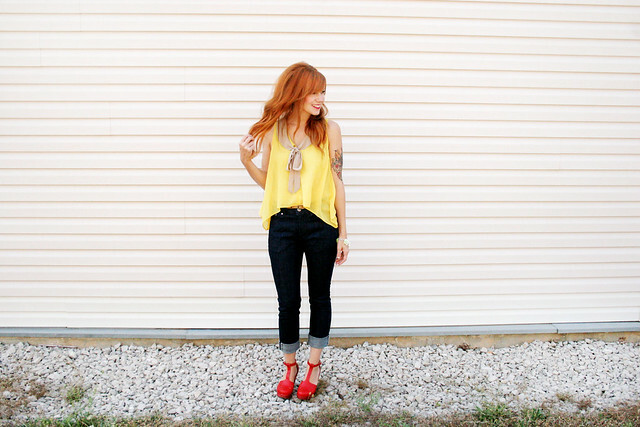 Love the yellow to your red hair. Have a nice weekend! I really love what your wearing, the colour blocking looks great! And before I even read the title your outfit made me think of lemon cheesecake! In a good way! 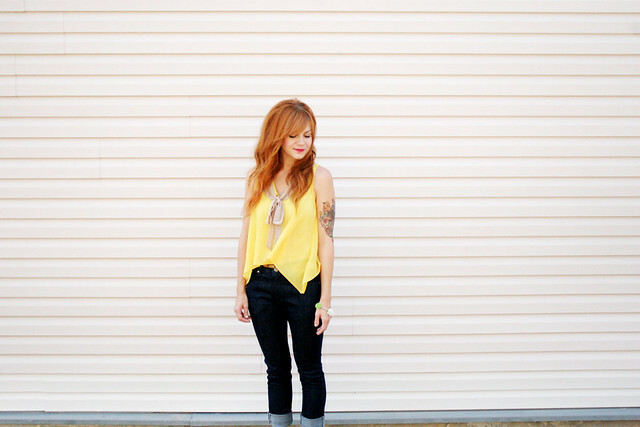 Your hair color + yellow = perfection. 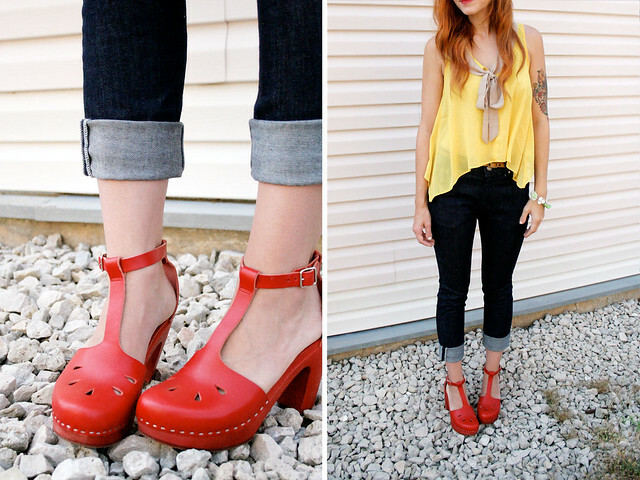 Those shoes are adorable and look very comfy, I like how you pair them with the yellow tank top. I don't think I could pull off a top like that, but it looks amazing on you. Love the shoes you borrowed too. I'm really interested in the idea of those jeans that can be custom fit! It seems like pants NEVER fit me right. I might have to start saving my pennies for some. what a great idea for customizing jeans. The jeans you are wearing are pretty fab. I'll bookmark their site for when it gets cool enough to wear jeans. holy awesome outfit batman! the lemon yellow looks so pretty on you katie. well you always look pretty. anyway those jeans are excellent. 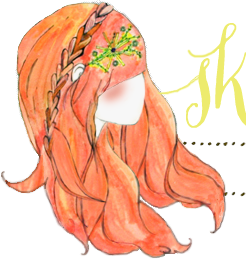 Ive been wondering, could you do a post on your hair dye experience? Like when you first did it, how you decided, mess ups, etc. Hi, Lydia! I started out going to the salon, so I haven't really had any mishaps. I showed her which color I'd like, and my friend Cassie made it happen for me. :) I guess I was lucky that way. Loving this outfit & that bracelet is so adorable!!! I've seen your tattoo a ton, and I still can't getover how beautiful it is! lovely outfit! the yellow really pops. i love this outfit! plus, seeing you in jeans is great! and i still can't get over how beautiful your tattoo is! Love the yellow and red together! Great outfit! That is lovely outfit and you look fab... I am just loving your style and yellow top. I love way you paired the colors here and how the shoes POP against the jeans. i love the vibrancy of these photos. all of the colors just pop when coordinated with the rest. terrific pairing. what photo editing software do you use? The one thing waterproof jackets that you simply should feel of is whether you happen to be acquiring the real catier pendents matter or not. Most men and women just believe of your value when shopping for swiss rolex. They have to have to generally be certain that what they may be buying would be the legitimate issue. best christmas gifts very important that you know what you are finding. Analysis and be sure of the thing s that you're buying omega speedmaster watches. You've to make certain that you happen to be getting the authentic louis vuitton wallets towards the less expensive price tag. Most of your time, these are just replicas or fake bags. So don't get fooled after you invest in these hermes birkin kelly handbags.